One of my favorite dishes to make is classic lasagna with a meaty marinara sauce. The recipe really started back in high school and I've worked on developing it, making it my own ever since. The original recipe was given to me by a wonderful friend of mine, Ginger. I practically lived at her house in high school, her family was like an extra family to me. Her oldest daughter just turned 13 - the same age I was when I first met Ginger and her husband Bernt (my youth pastor). Bernt married my husband and me at our wedding in October (2010) and his two oldest daughters read an Irish Blessing during the ceremony. I've known all 3 of his girls since they were born and they always will hold a special place in my heart. 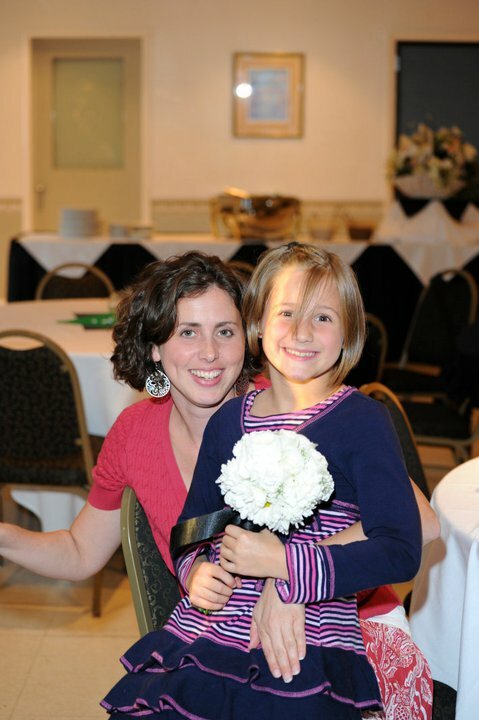 Their youngest daughter got the bouquet at our wedding and I love her giant smile in this photo! I also went to the college I attended and eventually met my husband there because it is where Ginger went - so I definitely owe her more than a cursory "thanks for the recipe" statement! Needless to say every time I make lasagna or lemon meringue pie (another family favorite) I think of Ginger and her family. I love being able to cook to take care of my friends or express my love for my family and Ginger gave me the first recipe I could work with to accomplish exactly that. I decided to make lasagna and a fudgy frosted brownie for my friend Kat who has recently had surgery on her ankle because #1 - they are recipes I know I do well...but mostly because of #2 - they speak of family, friendship and love. I started my cooking day by dropping an egg...something I don't think I've done in about 3 years...woohoo! I'm taking it as a good sign because all of the dishes I made tasted fantastic. Oh well - might as well put the "mess" legitimately in "tasty mess". 1. Bring a large pot of salted water to a boil. Drop in the lasagna noodles and boil for 6-7 minutes, then remove from the pot and lay out flat on sheets of wax paper or parchment paper to cool. 2. Make the sauce - brown the ground meat in about 1 tbsp. olive oil, salt and pepper, a pinch of garlic powder and oregano. Cook it thoroughly then set it aside. 3. Heat about 2 tbsp. olive oil in a large saucepan (I used a large pot because I double the recipe) and add in the onion and garlic, stir occasionally, cooking until soft. Then add in the tomato paste, Pasta Sprinkle, salt and pepper and balsamic. Stir thoroughly until combined and let it cook down until thick for about 5-7 minutes. Next add in the packet of spaghetti sauce seasoning and the water. 4. Simmer the sauce on low for another 5 minutes, stirring well. Now add in the diced tomatoes and tomato sauce. Add a little more spices to taste (if desired) and stir well to combine. I also happened to have a fresh sprig of basil, so I stirred that in, then let it sit and simmer for a good 20 minutes, stirring occasionally. 5. Add in the cooked ground meat, stir and heat through, letting the flavors mingle for about 10 minutes. 6. While the sauce is simmering, mix the filling. Combine all the ingredients in a large bowl and whip gently until everything is combined. If you are using frozen spinach, be sure to thaw the spinach well and squeeze out all the water. 7. Now you are ready to assemble the lasagna. Start with a layer of sauce, then a layer of noodles, then a layer of cheese mixture and repeat. End with a layer of sauce on the top, then sprinkle on the 1 cup of mozzarella cheese, Panko, parmesan and basil. 8. Cover the lasagna in foil and bake for 30-40 minutes at 350 degrees. Take the foil off and bake for an additional 5-10 minutes to crisp up the cheese and breadcrumbs. Let it rest for a good 10 minutes (re-cover it in foil to keep it warm) before serving so the dish stays intact and you don't lose all the sauce! For dessert I made brownies. Sounds simple and the recipe really is, but it is by far the best brownie recipe I've ever tasted. I love the denseness of the brownie combined with the creamy whipped chocolate frosting - it is amazing! You can also stir nuts into the frosting, I've used pecans in the past and it really adds a fantastic layer of flavor. I found the original recipe on allrecipes.com one night when Aaron and I were craving chocolate and all we had in the house was unsweetened cocoa powder. I haven't changed anything in the brownie recipe, but have tweaked the frosting and believe I finally hit upon the perfect chocolate frosting. 1. Preheat oven to 350 degrees and grease an 8" square pan. I used different pans because I doubled the recipe. Combine the melted butter, sugar, eggs and vanilla using an electric mixer until combined and very smooth. In a separate bowl, sift together the cocoa powder, flour, salt and baking powder. 2. Beat the dry ingredients into the egg and butter mixture until creamy and smooth. Try to resist eating the entire bowl of batter with a spoon - that's the hardest part! 3. Spread the batter into a prepared pan and bake for 15-20 minutes (depending on the depth of the pan). Be careful not to overbake, you want to keep these brownies fudgy and dense. 4. To make the frosting, whip the ingredients (except the cream) together well, dribbling in the cream until it reaches the desired consistency. You are such a caring friend. I miss you!